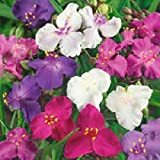 Spiderwort plants for sale – Easy plant to grow grown for the ornamental leaves as ground cover, planting in spring – autumn, better to buy plant or seeds. Leaves color green, white, pink, red or purple in elliptic shape with pointed edge. Blooming in the summer to autumn in triangle shaped flowers that appear in purple, pink, blue or white color.